Saturated fats are essential fats - The truth about food and medicines. False information given by experts paid to advise the public on diet. The U.K. Government's guide to eat low fat foods is wrong says a health charity. WE’VE BEEN DECEIVED ! SATURATED FATS ARE ESSENTIAL IN THE DIET. It is now generally acknowledged that the UK government advice to cut down or drastically reduce consumption of saturated fats was wrong. This was flawed dietary advice over decades, that has had disastrous consequences to health. It all came about when in 1953 Dr.Ancel Keys, an American physiologist, published a report linking saturated fats with the incidence of heart disease. His study covered data from 22 countries but to prove his theory he ‘cherry picked’ only the 7 countries that supported his hypothesis. Had he included analysis from all 22 countries no correlation would have been found. Thus was born the idea that polyunsaturated seed oils and low fat spreads (which were entirely new foods) should replace traditional fats, regardless of the fact that mankind has been eating saturated animal fats for thousands of years. Cases of heart disease began to escalate after the new polyunsaturated seed oils were introduced and widely promoted. The irony was that some time later when researchers analyzed some of Ancel Keys’ original data again, they found that heart disease was most associated with sugar intake, not saturated fat. At long last, saturated animal fats have been recognized as being essential in the diet, as they always have been. Unfortunately, advice to consume very little of these fats and substitute them for low fat spreads and vegetable seed oils, despite them having been proved to be actually harmful, is still being recommended by Public Health England (PHE) for example, in their Eatwell Guide. 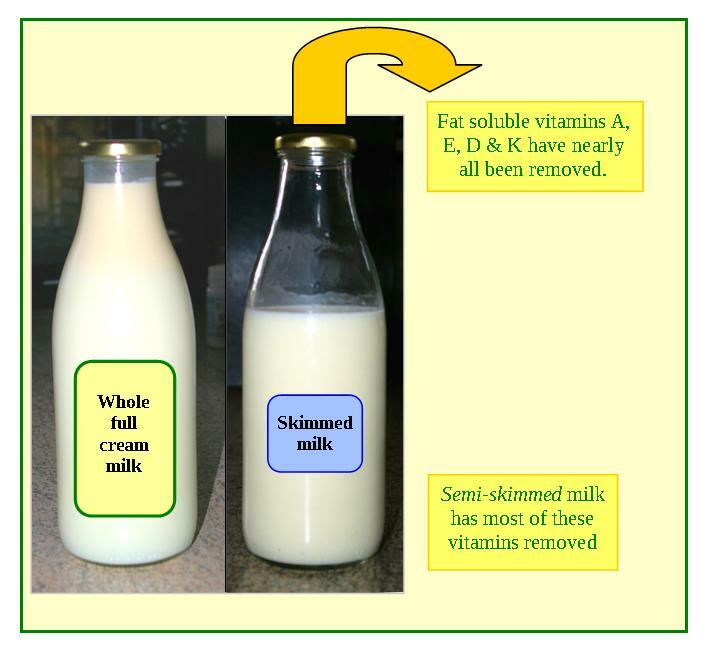 The Scientific Advisory Committee on Nutrition (SACN), the body that advises Public Health England and the NHS, says, ‘advice for younger children is to give whole milk and dairy products until they are two years old because they may not get the calories or essential vitamins they need from lower-fat milks. It is outrageous that health advisors should recommend giving children over two years old semi-skimmed milk instead of whole milk. This is milk that has been stripped of half the cream along with most of the fat soluble vitamins such as vitamins A, E, D and K that all children must have for normal growth. Even more importantly, the SACN does not seem to understand that saturated fats are essential for babies and young people for proper development of the brain. When you consider that some 80% of the brain is composed of saturated fat and then look at the present day number of children with learning difficulties, there must surely be a link. This lack of sufficient saturated fat in the diet, due to wrong advice going back several decades, may also be linked to the near epidemic of dementia and Alzheimer’s disease in older people in recent years. The following is a quote from the Weston Price Foundation, an independent society based on the teachings of Dr. Weston A. Price, who was a man respected all over the world for his views on nutrition. Anyone over the age of say 60 in the UK will remember being encouraged to drink a pint of milk a day and free milk being given to all children of school age, such was the value placed on whole milk. In those days osteoporosis was rare and rickets was a disease of the 19th century Victorian slums. Now rickets is back, and research published in The Lancet has found that the rate of hospital admissions due to rickets is the highest it has been since the 1960’s. It is no coincidence that this is about the same time as the drive against saturated fats and warnings about consuming dairy products first began. There is plenty of evidence showing that full cream whole milk actually protects against heart disease. Excess SUGAR is now known to be primarily responsible for diseases such as obesity, heart disease and cancer of the colon as well as dental problems, especially in children. A large amount of hidden sugar is found in drinks, especially colas, processed fruit drinks and refined carbohydrates such as breakfast cereals etc. Despite overwhelming evidence, the sugar industry remains all powerful and has done little to address the problem. CAN ONE TRUST THOSE WITH VESTED INTERESTS? The Scientific Advisory Committee on Nutrition (SACN), as mentioned earlier, advises on nutrition and related health matters and comprises 23 people, many of whom are Professors in their field. The SACN members are appointed as independent scientific experts on the basis of their specific skills and knowledge. There are also consumers and lay members. Of the 23 people making up the SACN, only 7 have no declared conflicts of interest, whilst the rest have links with Coca-Cola, PepsiCo, Unilever, Mars, Nestle, Kellogg’s, Danone & Kraft-Heinz. All these companies produce processed snack foods, processed cereals or fizzy drinks all of which are high in sugar and refined carbohydrates. Click here to see the list of the members of the SACN, as at the 2nd February 2017 Live Register of Declared Interests. These SACN members are people who are at the forefront of giving advice to the general public about what to eat to remain healthy. How much trust should we put in those who have vested interests in the food industry and who will undoubtedly be influenced by the industry’s demands, however much they may deny it? Rather than listen to advisory bodies, the public would do better simply to eat a variety of different food as fresh and as near to how it comes out of the ground as possible and refuse to be seduced by processed, precooked and packeted products. These products are all manufactured in the name of profit but at the expense of the health and wellbeing of those who purchase them. Previous generations ate largely unprocessed food and much less sugar and did not suffer from the degenerative diseases of today.